Home Useful information Information about tests Recommended LDL values corresponding to the risk level. E. Gulbis Laboratorija has responded to the call of the Latvian Cardiology Society to introduce in all laboratories of Latvia common (uniform) reference values for four lipid fractions, to indicate LDL reference value corresponding to the cardiovascular risk level, as well as to indicate Ne-ABLH non-HDL indicators – as it is defined in the latest European Cardiology Association guidelines in 2012. It is calculated: KH-ABLH Total Cholesterol – HDL (common cholesterol – high density lipoprotein cholesterol). This indicator shows not only ZBLH (LDL)(low density cholesterol), but also very low density lipoprotein cholesterols, which are the main triglyceride carriers. Studies have proven that non-HDL ne-ABLH better than LDL ZBLH reflects the possibility of cardiovascular risk in cases when triglyceride level is increased. Normative values are not presented. A family doctor assesses the cardiovascular risk level for each patient individually. 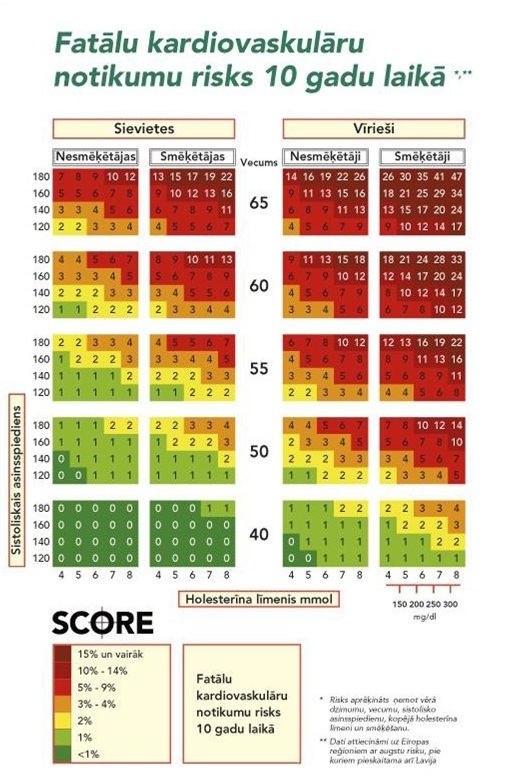 In Latvia so-called SCORE (systematic coronary risk evaluation) system is used to evaluate cardiovascular disease risk. However, it should be noted that these risk assessment principles refer to individuals who have not developed cardiovascular disease yet. It should be noted/stressed that patients with already diagnosed CV disease automatically are included into a high risk group and in this case there is no need for the risk calculation according to the SCORE system. * Risk is calculated taking into account gender, age, systolic blood pressure level, total cholesterol level and smoking. ** Data are related to the European regions with high risk, Latvia is also included there. Does a patient have a cardiovascular disease (coronary heart disease), cardiovascular disease, peripheral artery disease) ? According to the European CVD prevention guidelines all patients automatically are considered as high risk individuals. Any of the mentioned criteria classifies a patient as a high risk individual. The total fatal cardiovascular event absolute risk is calculated according to the SCORE system. 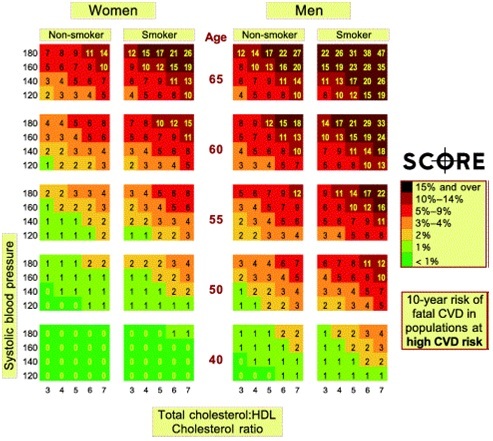 If cardiovascular death risk in the nearest 10 years is ≥ 5%, a person is included in a high risk group. Does a patient have metabolic syndrome? Thought in such cases it is not possible precisely determine the risk, it can be assumed that each individual additional risk factor the absolute risk will increase the absolute risk not more than 1 %. If in this way adjusted risk reaches 5%, then the person is classified as high risk. Patients with 2-pool KVS (coronary heart disease + cerebrovascular disease or peripheral arterial disease or other cases).